Every year, as the soccer season winds down, I find a part of myself wishing for the offseason to begin, because it means the recruitment of new players, the reveal of new jerseys, and the hope that next year will be better. But once the actual offseason comes, boredom settles in like a fog. Even when your team isn’t that good, watching them play soccer is always preferable than not watching them play soccer. At long last, the clouds are lifting. Minnesota United preseason is a week old and it’s hard not to be excited. Everyone is saying the right things, about how hard they’re working, about how the group is ahead of where they were last time, about how the rookies are looking better than expected, and how the newcomers are integrating faster than expected. I expect all of that, word for word, and I’m still happily buying it all. Preseason is a magical synthesis of the best of the season and the best of the offseason. New players are still coming in, the jersey release is still coming, and I’m full of hope. At the same time, the team will soon be playing actual games—first against college kids and then other pros—and we’ll get to watch some of them. The results won’t matter and so the emotional exposure is minimal. If something goes wrong, believe the team will fix it before the season starts. If something goes right, believe that they’ll be able to ride that advantage to the Supporters Shield. Best of all, I think, we’ll see the entire roster get their chances. We’ll see what the recent draftees can add, we’ll see what Christian Ramirez has learned after a few weeks in USMNT camp, we’ll see what Frantz Pangop actually can do, we’ll see how Harrison Heath and Tyrone Mears fit in, we’ll see if there’s a standout among our goalkeeping corps. We will see all of this, and more. In the same vein, what I find most refreshing about this preseason is that it offers a chance for a clean slate and a fresh perspective—a chance I invite readers to take with me. Anyone who watched the last season can’t help themselves having a detailed list of opinions on each player on the roster, some bordering on grievance. But consider just for this moment putting it all aside. Separate out what you know about these players from what you think about these players. Separate out your observations from your inferences. Leave your baggage back in 2017. To pick a famous example, I know that Kevin Molino is an attacking player with a proven track record of contributions in MLS. I know his focus is on attack and not at all on defense. I know that he can hit a pass through the lines, and I know that he can beat opponents on the dribble, but also turns the ball over frequently. I know that he is a threat to score with his head if he gets in the six yard box, and a threat with his foot in the rest of the penalty area. I think that his best position is on the right wing. I think that he doesn’t have the comfort to play in close quarters needed to be effective in a central role. I think that he doesn’t have the finesse or the quickness in reading the game to make that pass between the lines with the regularity of the league’s elite creators. I think that if Adrian Heath tries to shoehorn him into the #10 role again, the Loons are in for a long and difficult season. But…! I’m putting this aside (really). I’m ready and willing to have my views changed. If the team wants to try out Molino in the #10 role in preseason, I’m looking forward to seeing how it works out. It may change my view, and it may not. But I’m in the market for new opinions. That goes for every part of the field. Who will start at goal for Minnesota? I don’t have an opinion on that, I’d like to see Bobby Shuttleworth, Matt Lampson, and Alex Kapp get chances. I know Shuttleworth is one of the best shot stoppers in the league, but that he struggles. I know Lampson backstopped a defense that was 7th best in the league last year. I know that Kapp is a young player who the club clearly believed in enough to extend his contract. As far as I’m concerned, all three have a chance to be the club’s #1 option in goal, and I’m going to let the players themselves make their case before I form an opinion on the topic. 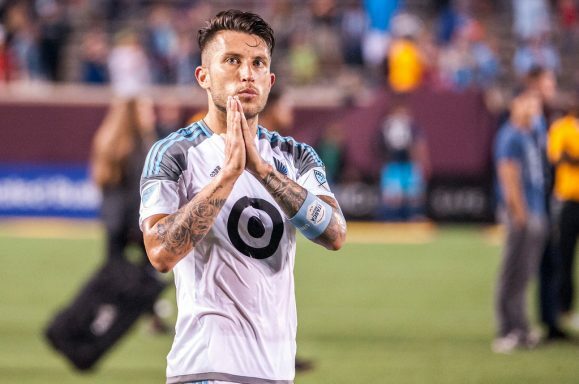 How should the Loons reform a back line that was historically bad last year? How many men should play in the midfield? Who should they be? Who plays on the left wing? Two strikers or one? Idk! To all important questions about the upcoming year, I say: I dunno, let’s wait and see. The preseason brings new opportunities for the coaching staff to experiment and learn new things about their players. On our side, as fans, let’s not let our experiences last year prevent us from drawing different conclusions this year. A new season means we can find hope in what we don’t yet know. Embrace that state of ignorance before it’s gone!